Look out on any street and gasoline-powered vehicles still dominate the road. But in the coming years, automakers like Toyota, Honda, and GM plan to start pumping out plug-in hybrid electric cars in a bid to keep up with the fabled EV revolution. Volkswagen, on the other hand, is taking a more conservative approach. As we reported months ago, VW is skeptical about the short-term possibility of widespread EV adoption. Dr. Karl-Thomas Neumann, Chief Officer for Electric Traction at the Volkswagen Group, told us recently, “EVs are coming, but they will have to be affordable.” And affordability just isn’t realistic quite yet. This week, VW CEO Dr. Martin Winterkorn echoed Neumann’s sentiments, explaining that hybrid and electric vehicles could make up 3% of sales by 2018. 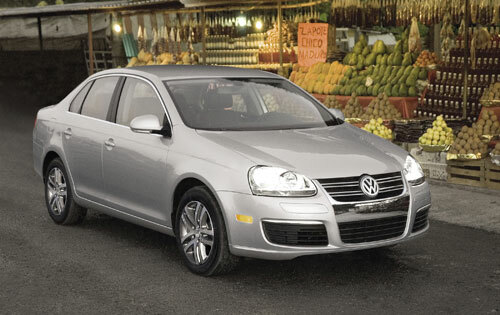 Upcoming models will include a hybrid Jetta and an all-electric Golf, set to be released in 2012 and 2013, respectively. But VW’s rollout schedule is nothing compared to other automakers–Ford plans to have 25% of its sales in the hybrid, plug-in hybrid, or electric category by 2012, and Nissan hopes for a solid 10% of all-electric vehicles by the same year. So why the reticence on VW’s part? It may have something to do with the company’s dominance in the clean diesel market. Tim Ellis, VW of America’s Vice President of Marketing, explains to us that diesel versions of the Jetta (the TDI) make up approximately 20% of total sales of the car. And, he says, diesel is an excellent interim technology between gasoline and electric vehicles. It makes sense for VW to stick with what it knows–and in the process, provide us with efficient alternatives to the plug-ins that are still mostly out of reach.